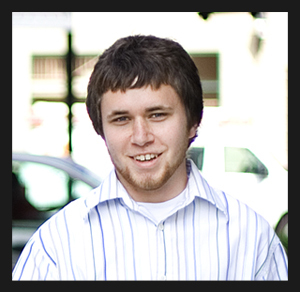 Corey previously wrote about how time is your new best friend. This is all because of compound interest. The more time you have to let your investments grow, the more your money can compound upon itself and grow faster. It almost sounds too good to be true, and unfortunately it is when you look at it in terms of investment fees. The effect of compounding can be sizable. Looking at the example from the post from above, investing $10,000 for 40 years while earning 8% annually grows to over $200,000. But what happens to your money when fees are included? Let’s look at an example. You invest in Fund A with $10,000 for 40 years that earns 8% annually. The fund charges 1.50%, which is roughly the average that you will find today for an equity mutual fund. After those 40 years, you will have paid a little more than $27,500 in fees. 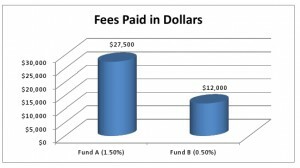 Had you invested in Fund B that charges 0.50% annually, you will have paid roughly $12,000 in fees. Some of you may be thinking that $15,000 isn’t that big of a deal. But let’s go back to the whole concept of compound interest. When you invest an amount of money, say $1,000, and it grows to $1,080 after one year, the next year, you earn interest on the entire $1,080. If you are paying more in investment fees in one fund versus another, you are not only being charged the fee, but you are costing yourself additional compounding of your money. 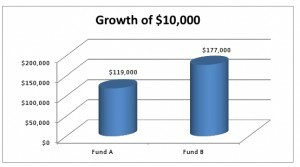 The $15,000 that you didn’t pay by investing in Fund B allows your investment to grow more. Put another way, $15,000 stays in your portfolio to compound over time. 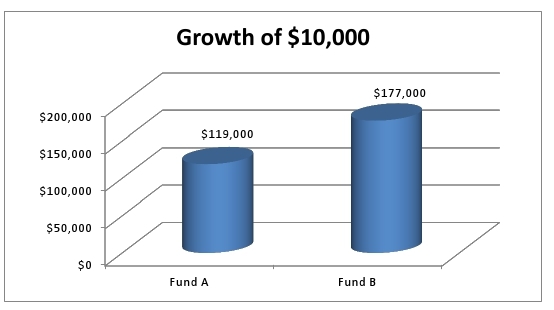 As you can see from the chart below, after 40 years, your investment in Fund A grew to just under $119,000 while your investment in Fund B grew to a little more than $177,000. 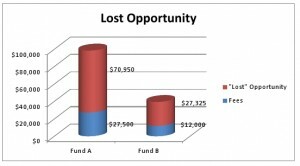 Remember that you invest the same $10,000 to start and both funds earned 8% annually for 40 years. The $15,000 in fees that you paid cost you roughly $58,000. In the chart below, I break out the actual fee you pay for each fund as well as the “lost opportunity” that the fee cost you in terms of additional compounding. You need to pay attention to fees. They are one of the most important things you can control when investing. There is no point in paying a higher fee for an actively managed mutual fund in hopes that the fund manager will earn you a higher return. In most cases, he will not. 80% of active funds fail to beat their benchmark every year. Find lower cost alternatives, like Vanguard. I urge you to review your investments and to look at the fees you are paying. It is easy to pay a high fee because you never get a bill for it. The money comes out of your investment, but it doesn’t show in your statement, just in your performance number. For example, Fund A, after taking into account the 1.50% fee it charges, returned 6.38%. Fund B returned 7.46%. When looking at just the performance, which is typically the only thing you see on your quarterly and annual statements, both funds performed decently. You would never know by looking at this number, how much money you are costing yourself. Pay attention to fees! That’s why I like to invest with Vanguard. 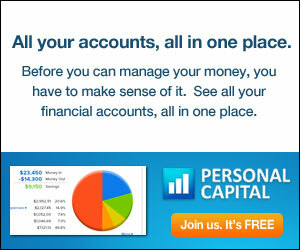 Their fees are very low and the funds do quite well comparing to other companies’ offering. Vanguard has been my “go-to” place for investing as well. Fees are lame-o. I don’t do much investing, but my work 401k has “management fees”, but I don’t see them doing a thing. I have no insight as to what these fees are for, and I just fees ripped off. I’ll look into Vanguard when I start actively investing again. For now, got to get my income up!